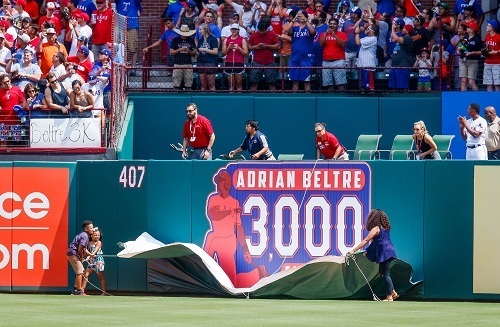 Texas Rangers’ third baseman Adrian Beltre doubled in the fourth inning of the Rangers’ Sunday game against the Orioles for his 3,000th career hit, becoming only the 31st player in major league history to reach that mark. However, the visiting Orioles spoiled the day, pounding Rangers starter Martin Perez for 8 runs and a 10-6 victory. Beltre entered the game at 2,999 hits. He got his first chance to reach the mark leading off the bottom of the second inning, but struck out. In the fourth inning, with Nomar Mazara on first and one out, Beltre got his 3,000th hit, driving a 3-0 fastball from Orioles starter Wade Miley into the left field corner for a standup RBI double. Following his hit, play was temporarily stopped to allow players and staff from both the Orioles and Rangers to enter the field and congratulate Beltre. Beltre’s children also entered the field to unveil a sign on the right field wall dedicated to his milestone. 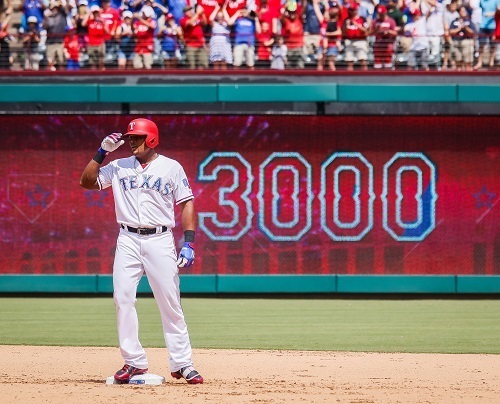 Beltre, a likely Hall-of-Famer when he retires, became the first Dominican-born player to reach the 3,000 hit mark. Jonathan Schoop and Welington Castillo led the Orioles' offensive attack, each going 2-for-4 with a home run and combining to drive in 7 of the Orioles 10 runs. Rougned Odor homered twice for the Rangers. Choo Shin-soo made a pinch-hit appearance in the ninth inning, batting for Delino DeShields Jr., but struck out. The Rangers open a three-game series at Seattle on Tuesday night.